Perfect blue waters of Moorea in French Polynesia. Don't forgo style when choosing swimwear with 50+ UV protection, this swimsuit by SunSoaked ticks both boxes. Here our our picks for the world’s most memorable swimming spots, which gives you 8 great reasons to buy that new swimsuit you’ve been eyeing off. These might be the ultimate holiday swimmers, combining loads of style and colour with sun sensible 50+ UV protection. Adriana long-sleeve top, $169, and Raquel high-waisted pant, $109, in Dolce Fiore by SunSoaked. Are these the ultimate holiday swimmers? by Sunsoaked. And while we’re on the subject of the life aquatic, here are a few swimming spots we love (and we think you will too). 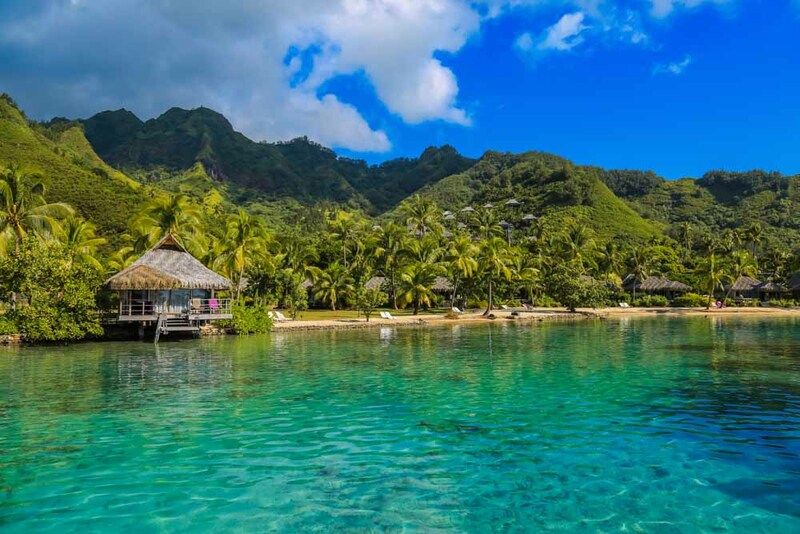 Leigh-Ann Pow, editor: Moorea in French Polynesia is my absolute favourite place to immerse myself. The water is impossibly blue and filled with a Kaleidoscope of fish and coral and stingray and black tip reef sharks which glide by with such grace that it’s not scary at all (well maybe a little bit). Being a water sign, I was literally in paradise. Go island hopping: The Gambier Islands, Huahine & Tahiti. Megan Arkinstall, deputy editor: About 45 minutes from the famous beaches of Seminyak and Kuta, we found a little patch of paradise: Sundays Beach Club (formerly Finns Beach Club) in Uluwatu. For about $30 each for the day, we had access to a beautiful, private stretch of beach on the Bukit Peninsula with its crystal-clear waters and pristine white sand. The fee includes use of kayaks, snorkels and SUPs, and credit at the seaview bar and restaurant – but the best bit? We weren’t hassled by anyone trying to braid our hair or sell us sarongs. Bali bliss found. Steve Madgwick, web editor: The longest river in the world is not such a secret swimming spot, but the how and where is. Instead of fighting the flow of the Nile in the polluted north of Egypt around Cairo, hire a felucca from the southern port of Aswan. Jump off the back of the boat holding onto a rope and let the desert-scape drift by as you head towards one of the largest human-made lakes in the world, Lake Nasser. Daniel Down, chief sub-editor: A secret swimming spot on the Vanuatan main island of Efate; the Blue Hole is an almost iridescent aquamarine lagoon set in the jungle just off the coast. You won’t believe how vibrant it is. Ask a taxi driver to take you there and spend a few hours diving into this incredible pool. Leigh Counsell, digital marketing manager: Maitland Bay on the Central Coast is my top pick as the 40-minute trek to the secluded beach makes the swim seem all the more rewarding. Also, it doesn’t involve travelling too far from home! Elliott Barsby, national sales manager: Lost Lake in Whistler is the best place to cool off after a busy day of Canadian summer activities – hiking, climbing and mountain biking. It’s obviously frozen over during the winter months but come summer it’s the perfect place to relax (or play around on the big rope swing) and catch up on your vitamin D.
Lara Picone, editor, Australian Traveller: Slipping into the Adriatic Sea off the coast of Croatia from a boat anchored offshore is pure bliss. The water is impossibly clear and as you scull about, the views of rocky cliffs and walled, ancient towns are what holiday dreams are all about. Alison Langley, account executive: Lucky Bay in Western Australia: the water is so clear that your troubles just melt away, and when you emerge you’ll find friendly kangaroos lounging around on the beach.